Thanks to everyone at Hatfield Farm for our amazing wedding! It truly was perfect and we had an incredible time! There is nothing that we would have changed and the staff were incredible! I had the pleasure of attending a wedding on your premises on Saturday, August 4th. I have a lot of medical problems including heart problems, mobility and respiratory impairment. I had a lot of worries about going to the wedding as the bathrooms are in a separate building and walking to the lake and back to Fort Clayton. As it turned out, I had a wonderful experience thanks to your friendly and helpful staff. Everyone went out of their way to see that I was shuttled to and from the lake. The washrooms were relatively easy to get to, even though I was in a wheelchair. Your employees, from the greeter at the Sheriff’s Office , the shuttle driver and the dining room staff worked very hard and the wedding went off without a hitch. I could not partake of your horseback rides or Rubber Rodeo but my son did and enjoyed himself very much. Please pass on my thanks to your excellent staff for making me and my family feel so comfortable and welcome. PS: It would be nice if the dining room had washrooms attached to the building. Now that the dust has settled a bit and I’m back in my old work routine, I wanted to send a huge thank you to you, Brian, and all the staff at the farm. You guys have exceeded any expectation that I ever had of how the day would go. All your help answering countless questions, how perfectly the ceremony was, the meal was amazing and the party afterwards. You guys truly know how to throw an event. I have heard nothing but rave reviews about our wedding day!!!! THANK YOU from the bottom of our hearts. You guys have created memories that we can treasure for years to come. Brian and all the Hatfield Farm staff. Jonathan and I wanted to thank you for such a beautiful wedding! We had an amazing time and we are so happy we booked our wedding at Hatfield Farm. Our guests loved it and I think our wedding will go down in history with our friends and family. The atmosphere was perfect! You were so pleasant to deal with and I appreciate you taking the time to answer all my questions. Thank you. You made the experience fun and one everyone will remember! Your humour was refreshing and made us relax and enjoy the moment. Thank you. Brian – I have to apologize for the 4am phone call! I was cold and my new husband was doing his duty to warm me up before he could “warm me up” (wink, wink, nudge, nudge). Thank you all for making our wedding a day to remember. You all did an excellent job and we really appreciated it! Ken & I felt it was important to write you a note of thanks following Leann & Matt’s wedding & reception on Saturday, September 17th. Firstly, I want to say that the staff was so wonderful to deal with. Not only were they completely knowledgeable about every detail, but they were so friendly and upbeat every time I visited or called to ask them questions (and I had lots!). She was an invaluable help to us since February when we first visited Hatfield Farm. Secondly, I would like to mention that the staff was fabulous. When we met with you on the 16th, they were so accommodating. It was easy to tell that they knew their jobs very well and we felt so comfortable leaving our meeting, knowing they would be at the helm on the 17th. They assisted our MC on the day of the wedding and coordinated all the details during the ceremony and reception so that everything flowed so smoothly. wedding arbor. It was so well done. WOW! We could not be happier. Everything was so beautiful – including the carriage ride in and out at midnight, the compliments given to Leann by the staff, Brian who was on night shift and Brian (yourself) who worked so hard to make sure that the guests who stayed overnight at the farm were safe. I could go on and on. Be assured that I will promote your venue to anyone who asks and I know that our guests who attended the wedding will do so also. Everyone had a fabulous time! Thank you again! Thank you so much for giving us the perfect wedding day anyone could ever ask for. The staff was very accommodating not only to us but to our friends and family as well. The venue was just beautiful and the food was terrific. We had so many guests tell us it was the most beautiful and relaxed wedding they have ever been to and we have to agree. Brian, you and your staff really made our wedding stress free. Thanks for making our fairy tale wedding come true. We will defiantly be coming back to Hatfield Farm. My daughter Becky was married at your location last week-end. I have to tell you Brian, I was a bit weary at first with the thought of my daughter being married on a farm. WELL… Much to my surprise and delight, the wedding was spectacular, the venue gorgeous and I was over-whelmed by the professionalism and kindness showed by your staff. Seeing my little girl being brought to her new husband by horse and carriage was lovely and the lake setting just perfect. I want to compliment you on a job well done and for creating a day our families will cherish forever. My name is Beverly York, my grand-daughter Ann had her wedding recently at your farm. Upon arrival, I was greeted very kindly by your staff. This letter is to thank Hatfield Farm and their dedicated staff for making my visit relaxed and comfortable. Being a senior citizen with limited mobility, I was a bit nervous entering the farm. After I was offered an air conditioned shuttle drive to the ceremony site – I actually found I could get on and off the horse driven wagon with ease. I was delighted with the ride and beautiful setting – very beautifully decorated lodge as well. Thanks again for your kindness and sincerity and making this quite the memorable experience. All the best to you and your staff and I will not hesitate to recommend Hatfield Farm for weddings to friends and family members. We wish to express our sincere thanks to you and the staff at Hatfield Farm for making our daughter’s wedding such a huge success. Our guests comments ranged from ‘wonderfully unique’ to ‘the best wedding they had ever attended’. I would also like to thank you for the little details that were noticed by everyone, such as the daisies in the ladies room, on the dog, and the lovely matching flowers in the mane of the impressive white Percheron that brought our daughter into the wedding site. The food was mouth watering, plentiful and served to perfection, and the decorating was excellent and done just as we had requested. Christa’s dream wedding was a barbeque with the guests in a relaxed and casual setting, you more than fulfilled this wish and made our daughter’s wedding a day that we and our guests will not soon forget. Again, our sincere thanks for creating the prefect wedding day. I attended my Granddaughter Jessica’s wedding three weeks ago, As a person who “doesn’t get around that well anymore” I had concerns about attending the wedding at Hatfield farm. The thought of hopping on a wagon ride and hours of standing in the outdoors was very worrying. But thanks to the wonderful staff at Hatfield farm, all of my concerns were soon put to rest. They’ve really thought these things through and have made the farm a very accessible and enjoyable place. Warm thanks them! Just a few easy steps and with a thoughtful, helping hand from one of the farm’s staff members had me easily enjoying my very first wagon ride in over 40 years, through a lovely wooded lane on my way to my Granddaughter’s “Big Day”. After arriving at Fort Clayton I was greeted by friendly staff, it felt like I was stepping into the old west. 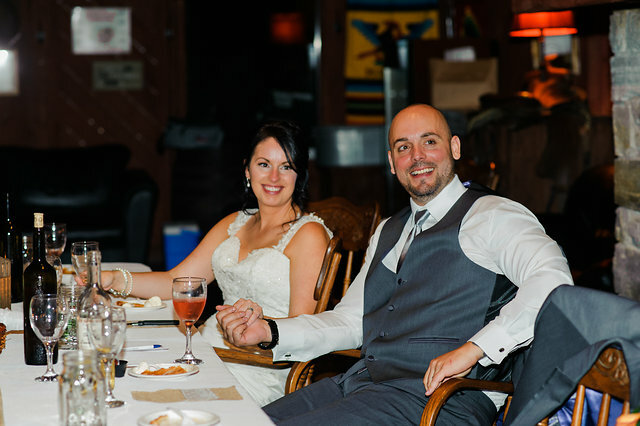 I was very happy to see that the staff had provided comfortable chairs for both the ceremony and for the wedding dinner. I am happy to report that there is not a single stairway to contend with in any of the buildings in the wedding area. All the entrances were ground level and are a short distance from each other, and even though I did not on ride the mechanical bull, it was fun to be able to watch family and friends having such great time! At the end of the evening It was a little chilly and I opted not to take the wagon back and was provided a shuttle vehicle right to my nephew’s car. Thanks so much to Hatfield Farm for making it possible to share in my Granddaughter’s happy wedding day! Worry free! Hatfield Farm hosted our Wedding on Sept 2, 2006. We are writing this note to say thank you for the BEST Wedding Day any Bride and Groom could ask for. It was more than we could have ever imagined. The staff at Hatfield are very well organized and even though the bride was an hour late you all made everything perfect. The food was excellent! Our friends and family are still talking about our wedding. They are saying it was the most relaxed and best wedding they have ever been to. We can’t thank you all enough at Hatfield Farm for making our day so memorable. Thanks, Sean and Lois McSweeney. When Charlene and I were planning and discussing our wedding plans, I suggested contacting you guys to see what you offered. Well Brian, let me tell you, you had us hook, line and sinker at the office. After dealing with your staff we could tell you guys were up to the challenge. We wanted the guests to have fun and a good time and they did. We are still getting calls from the people who attended telling us what a wonderful time they had. What an incredible day you provided for us. I have never felt so laid back and able to let go of the control. You all exude such a confidence, even though I was that relaxed, I knew you had it all under control. Thanks for making me feel like princess for a day. We’ll be back again.